Many studies of respiratory control require a constant CO2 to eliminate it as a confounding variable. Methods for controlling CO2 generally rely on feedback circuits which are subject to phase lags and instabilities. In 1998, we introduced a simple circuit (; Fig. 1A) which stabilizes CO2 levels regardless of increases in ventilation. It passively adds CO2 to the circuit from an external source at a rate proportional to any increase in ventilation above control. Because the CO2 in this reserve gas has a PCO2 equal to that in mixed venous blood, it cannot contribute to pulmonary CO2 exchange. Alternatively, CO2 can be supplied from previously exhaled gas. Banzett and colleagues  suggested one version. Our version (Fig. 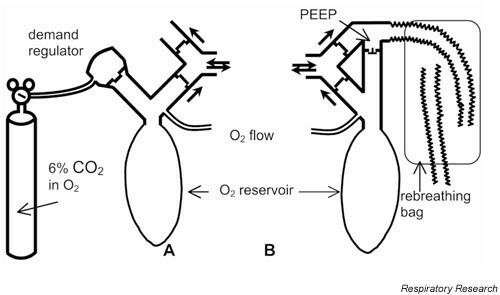 1B) operates on the same principle but is more compact, relying on a simple bypass valve between the inspiratory and expiratory lines and which opens only when the fresh gas reservoir is exhausted. When ventilation exceeds the fresh gas flow, the 'extra' gas inhaled will be expired gas from the preceding expiration. Pro-portional rebreathing of expired gas with a PCO2 approximately equal to that of mixed venous blood prevents hypocapnia. Moreover, if the fresh gas flow consists of a hyperoxic gas mixture, such as 100% O2, partial rebreathing ensures that FIO2 remains close to that of the administered gas. Is an external gas source mandatory for maintaining isocapnia regardless of ventilatory level? The circuit in the black box contains no compressed gas or electronics. We challenge you to breathe through it and a) change your expired CO2 level using any breathing pattern you want, and b) explain how our circuit works. Possible applications for this "mystery circuit" include preventing hyperventilation-induced hypocapnia in acute mountain sickness and resuscitation of asphyxiated neonates .